A summer job for the Ontario Ministry of Agriculture and Food during university led to a life-long love and a diverse business for Cathy McKay. The summer after completing her undergraduate degree in Environmental Biology, McKay got a job working in apple orchards. She immediately knew that she belonged there and after she had completed her Master’s degree in Plant Pathology, she and her husband bought a farm. More than 30 years later, she still loves being out in her apple orchard. She and her husband also raise sheep and have a corn maze and a pumpkin patch on their property. “I love the orchards. I like the aesthetics of them, and it’s an interesting and challenging crop technically,” says McKay. McKay was featured in the 2012 Faces of Farming calendar published by the Farm Care Foundation. 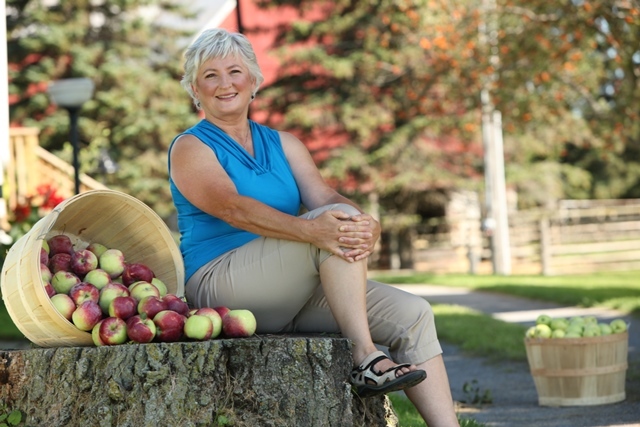 She’s the first apple grower to ever appear in the annual calendar that features the faces and stories of some of Ontario’s farmers. During the first 20 years on the farm, McKay and her husband both had off-farm jobs. Once established, McKay reduced her hours but continued to manage a small Integrated Pest Management (IPM) consulting business from home, giving advice to other farmers on how to care for their crops – in particular how to manage any potential threats from insects and other pests that can threaten an entire crop. Her husband continues to work as a livestock nutritionist. Although it was a steep learning curve at the beginning, McKay says neighbours were very helpful and supportive. “We’re very fortunate in this area that we have a group of apple growers who very readily exchange ideas with each other,” says McKay. To add to the idea-sharing, McKay writes a newsletter for the area growers containing information they can use in their orchards. The newsletter is published weekly during the growing season. McKay uses IPM extensively in the orchard and tries new pest management products as they become available. This helps her know which products to suggest for her customers so they can use as few pest control methods as possible while still protecting the trees and fruit. McKay has taken on a number of roles in the agriculture sector, including Vice Chair and director of the Ontario Apple Growers, member of the Ontario Pesticide Advisory Committee and a term as a director of CanAgPlus starting in February 2014, as well as sitting on the board of the Okanagan Plant Improvement Corporation. She’s also the treasurer of her church, belongs to a book club and enjoys doing yoga in her free time. McKay attends industry conferences and technical meetings to continue her lifelong learning and has taken several adult learning courses. With the apple orchard, McKay has built both a wholesale and retail market for her apples. Along with her farm-gate sales, she has built a system to help teach customers about her farm. She also welcomes tours from schools and adult English as a Second Language classes and community groups. Original article by Patricia Grotenhuis, Farm & Food Care (2012); updated January 2014 by Ontario Apple Growers. Photo courtesy of Farm & Food Care Foundation.